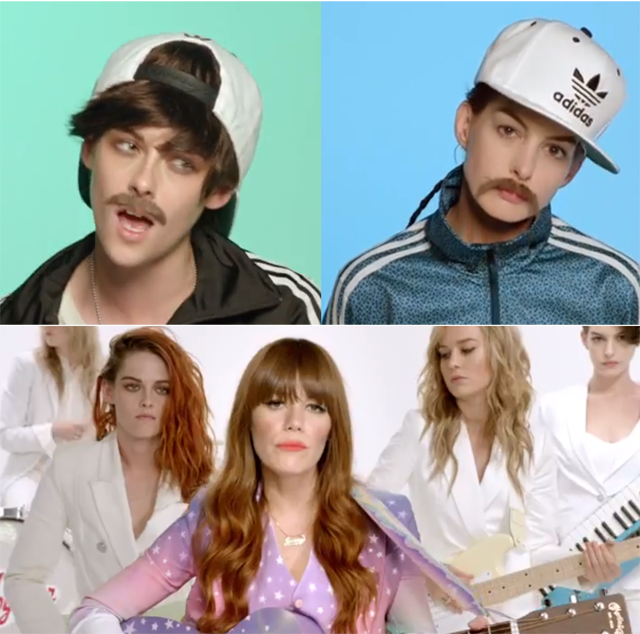 Ok we know Kristen Stewart and Anne Hathaway aren't actually men, but they do their best to make us think they are in Jenny Lewis' latest music video. The actresses are joined by Brie Larson and Jenny Lewis on camera as they all take turns at lip-syncing (some rather shabbily) "Just One of the Guys." At first we see the lineup as ladies in white, playing as a rocking female band. Then things turn interesting as Anne Hathaway appears on screen in a mustache and wearing a rather interesting track suit. It's not long before we see all the "band members" transformed. Then we get to experience Anne Hathaway truly displaying her acting talent as tears stream down her face on camera. We waited for the other girls to follow in her footsteps. Maybe they just aren't as good at crying on demand. Great song, entertaining concept. But we wouldn't recommend any of the girls take any roles in their future that require them to cross dress.